New Disc Golf Course Now Open! 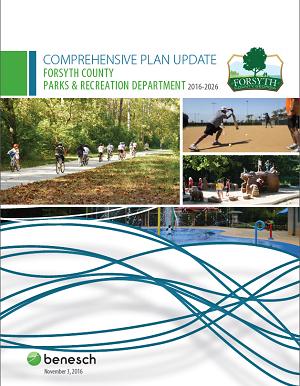 This Parks and Recreation Comprehensive Master Plan Update is a ten year vision plan that will provide County staff and elected officials with a road map through 2026. The plan will help guide decision making and actions as the County balances the challenges and opportunities of rapid growth over the next decade. This Plan was carefully crafted by staff, the public, volunteers, and with the assistance of outside experts to ensure that future generations will have adequate parks, greenways and open space. 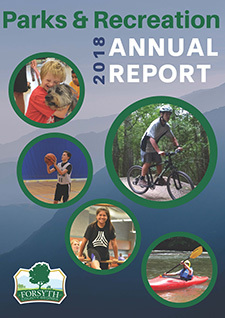 Forsyth County Parks & Recreation Department is an accredited agency through the Commission for Accreditation of Park and Recreation Agencies (CAPRA) and the National Recreation and Park Association (NRPA). CAPRA accreditation is the only national accreditation for park and recreation agencies, and is a measure of an agency’s overall quality of operation, management and service to the community. This mark of distinction indicates that an agency has met rigorous standards related to the management and administration of lands, facilities, resources, programs, safety and services. The department is one of only 166 departments nationally to hold the recognition.